After several EPs, upstart Bay Area alt rock band Case In Theory debuts its first full length album, Cinematic. CiT blends the edge of the independent music spirit with an atmospheric and melodic character. The arrangements are lush with spry and bright guitar and harmonious vocals. Sometimes the result can be light, melancholy and soothing, as on The Day. Other times, within the same motif, the music kicks as on With Open Eyes or Run Like Hell. Mostly, the music is quite persuasive, displaying the talent in musicianship and composition. Cinematic is marked by three instrumentals, namely Mavericks, Mavericks III, and Mavericks IV. (Don't ask me what happened to II, because I don't know.) While the vocal songs are quite good, I was even more impressed by these three diverse numbers, especially the lively convincing Mavericks III. This piece puts them into a modern progressive category. CiT could cut an album of instrumental alt prog, and be equally engaging. There's little doubt: with Cinematic, Case In Theory is on to something quite good. 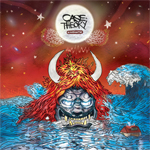 With the abundance of alternative and indie music vying for the attention of modern listeners, Case In Theory deserves renewed attention. Very recommended. Case In Theory's Cinematic proves once again that the spirit of independent, melodic, and alternative rock is alive and significant in it's existence outside the mainstream.